The stud is owned and managed by Louise Parry, in partnership, since 2005, with her son, Andrew. 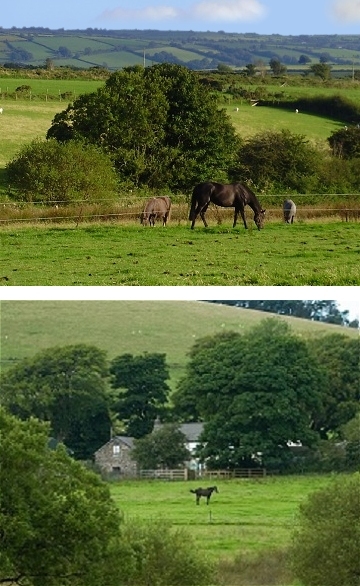 We are situated in 150 acres of permanent pasture on the edge of the Preseli Mountains in Pembrokeshire, West Wales. We have farmed here since 1979, continually striving to improve both the quality of our stock and the environment in which they are reared. The mild climate and high rainfall encourage good grass growth throughout most of the year, something that we believe contributes to the success of our thoroughbreds and our Welsh mountain ponies. Tenbridge scored again at Chepstow yesterday, winning over a mile to record her third success at what is her local track, after her pair of wins there last August. Royal Arruhan produced a bay filly yesterday, the fifth and final arrival at Pantycoed this season. Two Moons became the first Pantycoed-bred winner for 2014 when getting up close home to win a seven furlong maiden at Southwell today. Second foal of the season at Pantycoed is a bay colt by Poet's Voice out of China.